More and more people are searching for ways to improve their property that will not only serve a functional purpose, but also improve the aesthetics of their house while not costing the earth. For a simple and effective way to ensure all three of these goals are met, many homeowners are deciding to install a custom-made veranda. Read on to discover the top three reasons to purchase a glass veranda for your home this year. Whatever the time of year or weather, a luxury veranda installed for your home will be of benefit in any season and will enhance any occasion you may hold in the relaxing confines of your garden. So whether you intend on hosting a summer garden party for your friends and family or require shelter from the winter weather, a veranda really can cater for all eventualities. As well as serving a practical function, a veranda installation in your home can prove to be quite the garden feature to truly wow your guests and neighbours. If you choose to use a reputable firm like 123v to manufacture, design and install your veranda, you will be spoilt for choice with their vast range of high quality, purpose-built cantilever and traditional glass verandas for families across the UK. 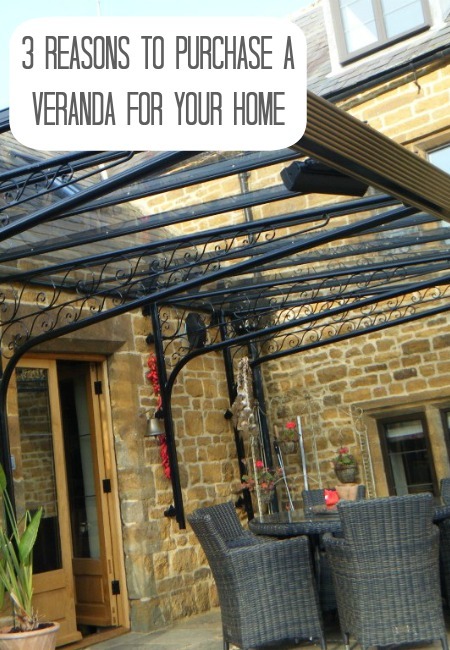 Assembled using hardened glass and cast iron supports or aluminium, 123v’s verandas are award-winning and have been showcased at the BBC Gardeners World Live Show, as well as at the Grand Designs roadshow and many others throughout the UK. For those seeking a more affordable alternative to adding an extension to your property, the installation of a veranda is a far more cost effective solution that can even add value to your home, allowing you to shelter from those rainy days as well as save for them. In addition to providing affordable, tailored verandas for all seasons, 123v are UK industry leaders in the design, manufacture and installation of bespoke canopies for homes, gardens and commercial properties, as well as providers of a wide range of carport designs to protect your car from the elements.